Please choose from the Pantone categories below. If you have any questions please don’t hesitate to contact a member of the Design Face sales team. click here to join our mailing list and keep up to date with our latest products, tips, tricks and special offers. What is Pantone and why do I need it? No matter what graphics program you are using, colour laser and inkjet prints or even your computer monitor can never truly represent ‘litho’ inks printed on paper. Uncertainty as to how colours will appear when printed is not a new problem, which is why for the last 40 years PANTONE® has continued to create guides that everyone can trust. With so many variables in the design and printing workflow, PANTONE® always gets it right. 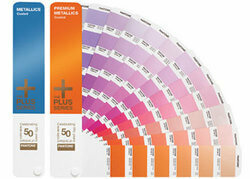 We stock the complete range of Pantone reference books, guides and chip sets. Coated / uncoated / pastel / foil / metallic guides are available. The difference between coated and uncoated is… Ink can look different on a coated paper (magazine or flyer) and an uncoated paper (letterhead) – it slightly effects the colour to the eye. Hence why both coated and uncoated versions of the books are available. A guide is a fan book (a long thin book that fans open, fastened with a rivet). A chip book, is a book of colours, perferated, so you can tear out your chosen colour, to show/give to client… present on a mood board etc. The Pantone Colour Bridge is probably the single most useful Pantone Guide available. Your screen will never match what you get back from your printer – FACT. The only way to ensure your full colour artwork returns from your printer with any true resemblance to what you expect, the Pantone Bridge Guide is the only thing thats going to help you. Full colour printing, is all about CMYK – yet when we look on screen, (and often when designing) we see RGB – it’s what a monitor displays. But when that file goes off to print, it will be converted to CMYK. By using the Pantone Colour Bridge, you can pick a colour (or convert a spot colour) to it’s nearest resembling match – and giving you the CMYK breakdown – will ensure that when used, where-ever used (be it in a magazine, exhibition graphics, even on the web) that what you design should match throughout all mediums. Find Pantone colour bridge and CMYK process guides here.